Woodworking is a fun hobby. It takes time, practise and a lot of patience in order to master it. One key item every budding woodworker should invest in, is the magical workbench! If you’re curious about what to buy, read on ahead. Here, we will find out why you need a workbench, some hints for buying them and my picks for the best workbenches around. You may be thinking a workbench is a waste of money. Surely you can create a small project at the kitchen table? Well, you could; but a workbench will save your house becoming a mess. You also need the strength and sturdiness of a workbench. Any old table won’t cut it. The absolute necessity for all workbenches should be its sturdiness. No matter what type of woodworking you’re doing, you need to ensure that the bench can withstand all manner of sawing/drilling etc. If it look flimsy, or shakes a lot, don’t buy. A lot of workbenches now come with handy storage spaces. This is ideal for those who have limited space within their homes or offices. You don’t need anything fancy, a couple of drawers or hanging space for tools would be good for most users. This is an important point for professional woodworkers. You will be at this workbench for hours at a time. You need something that is at the right level for you. If the bench is a little too high or low, you can usually adapt; however, it would be best to take the time to find something appropriate. You don’t need to spend hundreds on fancy benches. Ignore sellers who use posh words to describe wood varnishes and vises. Do your research, or better yet, have a look at one of my picks below! Which wood type. People can spend ages deciding on what wood to use. In all honesty, no matter what you use, it’s going to look beaten up after awhile anyway. Height. Choose a height between your thigh and waist. That’s it really, anything in between will be fine. Don’t go fancy. A good workbench needs to be flat and sturdy; don’t get fooled by add ons. Portability. Do you need this? You know how I said storage is pretty useful? Well… The Hopkins shelving storage system gives you a hell of a lot of storage for a great price. This set includes 4 workbench legs and 6 shelflinks with plans on how to create the ultimate workbench. All you need is the plywood and 2x4s and you’re ready to assemble the workbench. This is a great unit for someone who likes the flexibility of being able to create a storage system that you require. With a little bit of building know-how, you can have a fully functioning workbench ready in no time. The negative? You have to provide the lumber. The positive? You have to provide the lumber. You get a storage system schematic but get to use the wood that you desire. Do you move around a lot? Need a workbench you can grab and take to a friend’s house? Look no further than the Keter! 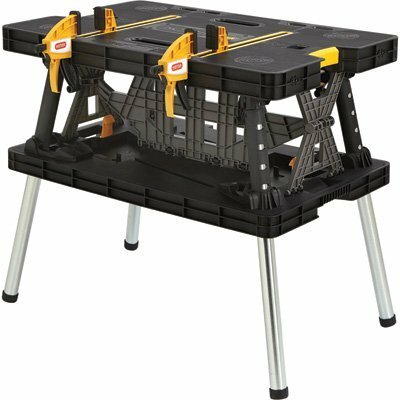 This folding workbench is ideal for anyone where portability is key. It takes 30 seconds to setup, weighs 27 pounds and has a 1000 lb capacity! It’s steel legs allows it to withstand a good amount of work being completed. The heavy duty worktop measures at 33 X 22 inches approximately. This is great for anyone needing a smart bench for a good price. Ok, you may look at the price tag and think whoaaa. Trust me, this is the workbench to go for if you’re a hoarder. I know too many woodworkers who buy hundreds of nails, tools, bits and bobs and have nowhere to store them. Well, this is their idea of Nirvana. 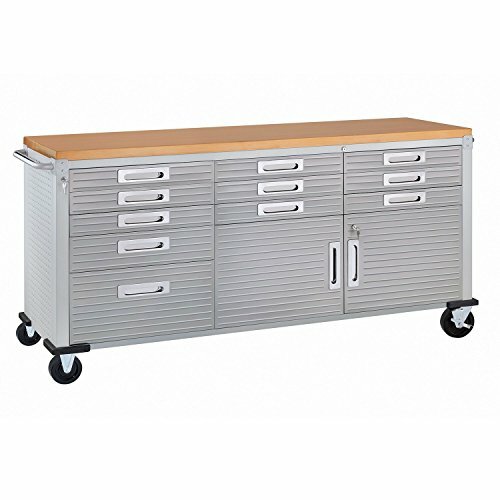 The Seville Classics have created the rolling workbench; a strong bench which has the storage capabilities to suit anyone. It comes with a 2-door cabinet, a full width shelf, 4 height adjustable positions and 11 lined drawers. The stainless steel exterior is also covered with Ultraguard to prevent against unsightly fingerprints. This is a massive boon for anyone with children running about! It has a 500lb loading capacity, less than others on this list; but, its storage is the main reason to buy. It has a large surface area, 77” x 20” x 37.5”. The rolling wheels are also useful if you do need to move the workbench around the home or office. A great purchase for those who need the storage. 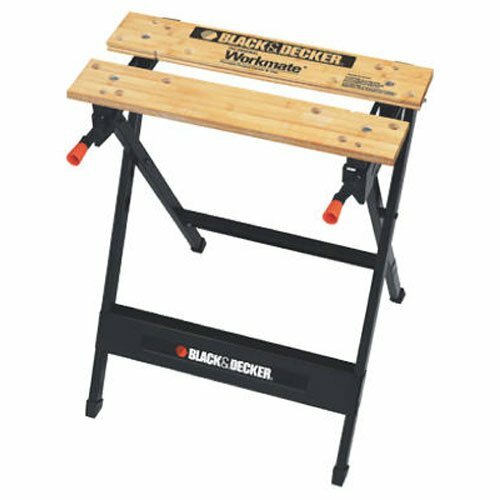 Almost anyone who has done any DIY in the home will have heard of Black and Decker. They are a huuuuge brand and have created some pretty awesome products. This workbench is one of those. It’s also my budget pick for this list. 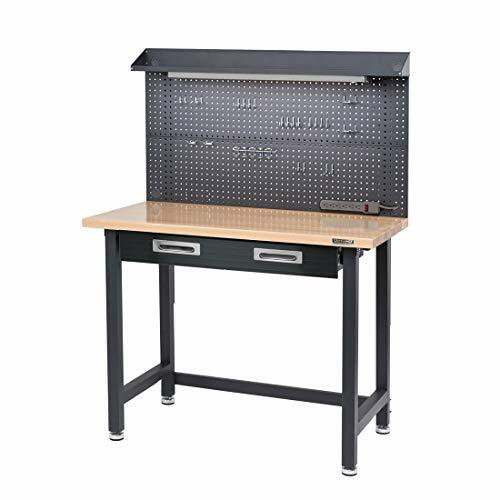 The durable steel frame allows this workbench to have a loading capacity of 300 lbs. The non-skid feet will prevent the frame from moving. It measures roughly 33.3” x 5” x 5” and folds flat for easy storage. This comes at an amazing price, it’s small enough to fit in most homes, holds a decent capacity and is made by a reputable brand. A great pick for new woodworkers or those strapped for cash. Yes, I know there is already a Seville Classics in the list; but trust me, this is different. This doesn’t have the luxury storage capabilities of the other one, but, it is a smaller, heavy duty model with some good storage. It’s cheaper but just as strong. This workbench is for anyone needing a sturdy surface without needing all the bells and whistles. 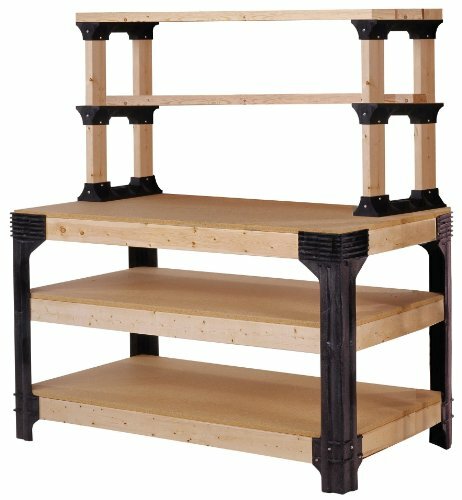 The workbenches listed are all great tools to use when woodworking. They can be changed, held, moved and used in all woodworking tasks. What you get depends on what you might need and the budget you have. My overall winner goes to the Seville Classics UltradHD. It’s well priced for the high quality frame you get. It isn’t ridiculously big and has storage for all your tools, bits and pieces. Overall, a great workbench for woodworking.